I receive these types of statements at Hypothyroid Mom all the time. I too struggled with weight gain that didn’t make sense. There I was a healthy eater who exercised regularly yet the pounds were packing on. 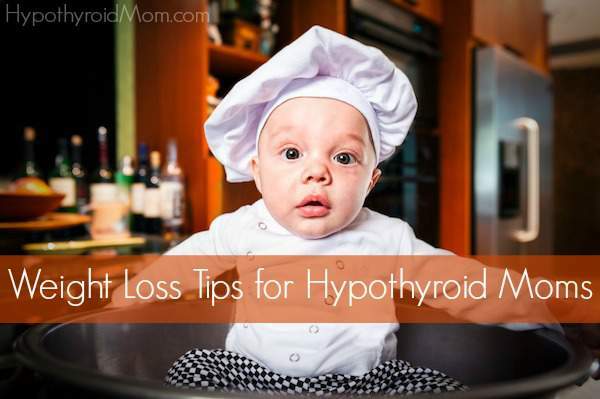 The thyroid helps regulate metabolism so you bet that weight gain is a common symptom of hypothyroidism. Optimal thyroid treatment is essential for maintaining a healthy weight for people with hypothyroidism, but there is more to it. I reached out to holistic health expert and thyroid specialist Jen Wittman for weight loss tips. For those of us living with a thyroid disorder, keeping the weight off can be a frustrating endeavor. If you have Hashimoto’s, it’s even more of a roller coaster ride with your weight fluctuating up and down ceaselessly. Well, first, it’s important to understand what stands between you and long-term weight loss. Let’s take a brief look at the 5-major players and culprits that could be keeping you from a mirror-friendly figure. Sugar is pervasive in our American diet and shockingly, it is 4X as addictive as cocaine. When it comes to your body, sugar is pretty much just as bad if not even worse for you considering the inflammation it creates in addition to helping you pack on the pounds. All kinds of foods that you would not associate with sugar have been processed with this other “white powder.” Did you know that everything from taco seasoning to tomato sauce contains added sugars? Even if you only eat “natural” sugars from fruit, honey, agave nectar, you could be ingesting an enormous amount per day. I am not saying to cut sugar out of your diet forever. Fruits definitely have some health benefits as does raw honey but by eliminating sugar from your diet for a short period of time, you let your body learn to regulate your blood sugar levels, get a better sense of when you’re actually hungry, increase your immune system’s ability to fight off illness and ward off Candida infections. Who doesn’t love a buttery croissant, a piping hot piece of pizza or a comforting piece of chocolate cake? I know I do. In fact, my last meal on this planet will be a steaming plate of biscuits and gravy, this I know for sure. However, your waistline does not like grains and in fact, your body converts grains to sugar as well. SUGAR! Argh. We all know that stress releases cortisol but how does that affect your ability to lose weight? Well, cortisol sets off a cycle of releasing glucose from your tissues. This, in turn, signals your body to store fat – not cool! When you’re chronically stressed, you’re releasing a steady stream of cortisol into the system. This makes your body think it needs to protect itself so it directs the body to store fat in your abdomen (good lord!) and around your organs. Also, when cortisol signals the body to release glucose, your insulin levels will begin to rise. After repeating this cycle over-and-over again, you could develop insulin resistance which brings me to my next point…. Insulin resistance just really stinks all around. It is a signal that your body is not processing sugar well and that some of your cells do not have the ability to respond to insulin – a key factor in how glucose gets stored as fat. Basically, insulin allows the cells to open and take in glucose to store as fat. This fat is then converted into the energy the body needs to function properly. When cells don’t open the door to allow glucose in, your body is signaled to create more insulin to help prop that door open. The big issue here is that now, your body has too much insulin in the blood and it has nowhere to go. So glucose has no option but to sit on your front stoop (your abdomen and organs) as fat until your cells decide to open the door….which won’t happen if the blood sugar imbalance cycle continues. This makes it hard for your body to burn fat as fuel for energy. It’s busy burning the sugar in your body but not the pesky fat sitting around your waist. Leptin seems to be all over the media these days but what is it? Leptin is a powerful hormone which tells your brain what to do – it signals whether you should be hungry or not, need to eat to produce more fat or if it’s time to maintain and repair the body. Leptin starts the conversation between your fat stores and your brain to discuss energy levels and where the energy should go. It helps regulate hunger signals, tells the body whether to store fat or if it’s time to burn some. Like insulin resistance, leptin resistance occurs when there is too much continuous exposure to leptin itself. This happens when you eat a diet high in sugar, grains and processed foods. When all that sugar gets metabolized in your fat cells, the fat will release a surge in leptin…and the cycle continues. Sugar – again! This is why following an anti-inflammatory, low-sugar, low-grain/carb diet is important for overall health and weight loss. Steps to use to stop the cycle? After taking a thorough health history and reviewing blood work, one of the first things I do with my Thyroid Loving Care clients, is perform a diet assessment and have them complete a food journal. Looking at all of these factors paints a pretty clear picture of what might be stalling weight loss and exacerbating symptoms. Without knowing your unique set of symptoms, there are some basic things that all thyroid sufferers can do to help keep the pounds at bay. You will not believe how fast the weight can come off when you limit your sugar intake. This doesn’t mean you can’t ever eat anything sweet again. It just means you can help your body recalibrate your taste buds to enjoy more of the foods that nourish you and less of the sugary foods that leave you heavy and inflamed. Although, I tailor sugar detox plans for some of my clients, I heartily recommend Diane Sanfilipo’s 21-Day Sugar Detox or Sarah Wilson’s I Quit Sugar. They work! By far, I’ve found a Paleo or Paleo-like diet to be the most successful in helping my clients lose weight. While there are other diets I use to repair the body and balance hormones, the Paleo diet is effective at helping a person balance blood sugar and reverse insulin and leptin resistance. It’s also quite delicious and easy to do. As with anything, a Paleo diet can be taken to the extreme. What I have found that works best for general weight loss and overall health are meals consisting of 75% – 80% vegetables (a mixture of cooked, raw and fermented), 10-15% protein, 10% high quality fats (from olives, avocados, coconut oil or olive oil) and a small portion of nuts/seeds or even rice. This is a Paleo-like diet and it’s also quite Mediterranean. There is a lot of conflicting information about what is and isn’t considered Paleo so I just use my common sense and eat meals that are balanced for me and works for my clients. My body knows if it needs some grains and I honor my body’s natural intuition. You can too! Here are just some great resources for adopting a Paleo or Paleo-like lifestyle. There are loads and loads of fabulous websites and cookbooks out there on Paleo/Grain-free/GAPS living. Type in any of those search terms and you’re sure to find many more. This is one of the most overlooked methods for weight loss. When you’re stressed, you are sending a continuous stream of cortisol into the body which as we learned above, is a major no-no for weight loss. It’s imperative that you build in time for you to just breathe and relax each and every day. Your body deserves it and you do too! I wanted to show the breadth and variety of a Paleo or Paleo-like menu plan so the daily menu samples below are quite diverse. When I create a custom-menu plan for a client, it involves the efficient use of all ingredients throughout the week for time-friendly, budget-friendly recipes and grocery lists. Jen Wittman is a Certified Holistic Health Expert, Chef, Author & Vitality Coach, who teaches people how to heal thyroid and autoimmune conditions naturally at Thyroid Loving Care. All of these ideas are great. What do you do though when you can’t get off the couch to make all this stuff. When your joints ache and your levels are fine. When you are so exhausted from not eating much all day ( it’s just to much work) , and working 50 hours a week. How do I do all this. I had a cancer diagnoses over 2 years ago, I still feel awful, and I keep reading all these great ideas. Then I think about doing them and it exhausts me thinking about it. I really need some help . Hi Amy, I hear you about the exhaustion. I was so exhausted that just getting through the day was too challenging that I would fall asleep sitting up at work. It sounds like you may not be optimally treated for your thyroid. There is hope to feel well but the first step is finding a doctor who gets that “normal” thyroid doesn’t mean it’s right for you. Here are resources that I put together to help my readers locate good thyroid doctors. Is there any websites out there that have something for daily weekly meals because my wife and I have no idea what to put together for her that she might like. We really need some help we don’t know what to do she is getting so depressed by gaining so much weight and it’s happening quickly. We’ve been married for 26 years she has had three children and we are struggling with having kids in the house and trying to figure out a good menu plan . Please help I don’t want to lose my wife I’m a man that desperately needs the love of his life .